A dunce cap, or dunce hat, as it is sometimes called, is a sight reminiscent of schools in eras gone-by. Students wore the cap to help them focus better as they sat in the corner or in front of the room. Making your own dunce cap is essentially learning to make a paper cone. A small party hat is made in the same way; the basic difference is that a dunce cap is usually taller. Set the paper on a clean, smooth work surface, with the wide side facing you. Hold up a piece of yarn along the tall, or shortest, side of the paper. Cut the yarn so it is approximately the same height as the paper, using scissors. Tie one end of the yarn around the pencil, or wrap the yarn around the pencil once and tape it in place with painter's tape. Hold the loose end of the yarn at the bottom left corner of the paper. Hold the pencil in the other hand, pulling the string taut. Press the pencil down while moving your arm to make an arc across the paper, starting near the top left corner, working your way to the right, ending at the bottom edge. Hold the yarn at the corner the entire time, and keep the string pulled tight. The string-and-yarn combination becomes a homemade compass. Cut out the paper along the penciled arc. It should look like 1/4 circle. Roll the paper into a cone shape so the bottom left edge, where the two straight sides meet, becomes the point. Position the cone on the head of the person who will wear it and adjust the amount of paper overlap so it fits comfortably. Place a piece of clear tape along the bottom edge, smoothing the overlapped tape over both the front and inside of the cap. Remove the cap from the model's head, then staple the cap together through the tape. Apply another piece of tape over the staple on the inside so it doesn't scratch her skin. Apply bits of double-sided tape between the overlapped areas of paper so the cap stays closed. Press stick-on letters onto the dunce cap so it vertically spells out the word "dunce." If crafting with children, allow them to use different colors of paper or to add stick-on stars to their caps. The longer the paper, the taller the cap. 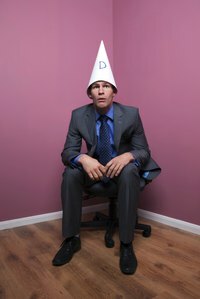 Straight Dope: What's the Origin of the Dunce Cap?